From left to right; Virginia's mother-in-law Janice Burchell, Virginia herself, and her husband Howard Burchell at the King George Farmer's Market. JennEclairs is operated by Virginia Burchell, who was born and resides in King George County, Virginia. Formerly the head baker for Howard's Restaurant and Bakery, she has worked in a bakery environment since she was 16 years old. 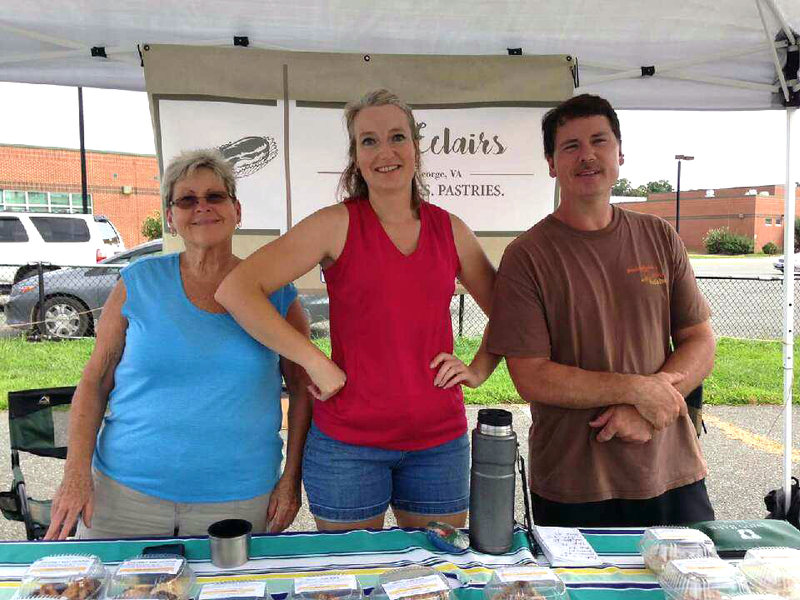 Living and baking atop Hickory Nut Hill with her husband Howard and their chocolate lab Abby, Virginia's latest sweet creation is coming to a farmers market or event near you! Eclair batter is whipped up fresh on Hickory Nut Hill and baked into light, fluffy golden shells that house fresh custard.